Hawaiian Airlines will offer daily service between San Diego and Maui for the first time since summer 2008. It is one of two daily nonstop flights being added to Maui in June. The other is an Oakland to Maui flight. 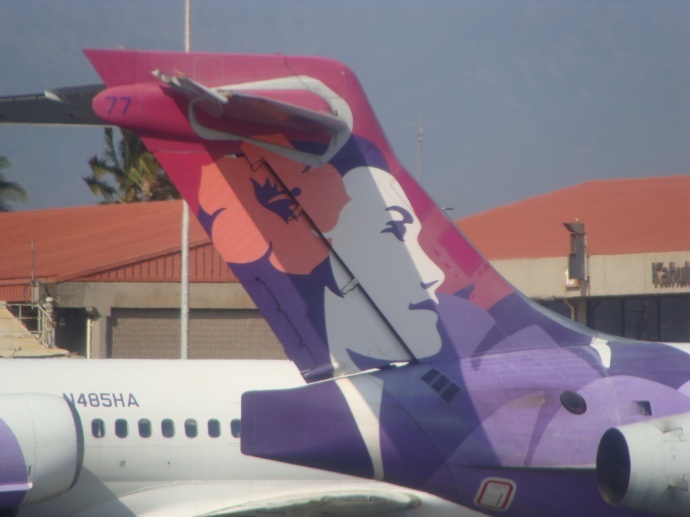 Hawaiian Airlines to add two seasonal flights between Maui and California for the summer. File photo by Wendy Osher. The flights are part of the company’s efforts to expand its service from Hawaii’s largest visitor markets for the summer peak travel season. A third Hawaii/California flight starts in June between Los Angeles and Honolulu, utilizing the company’s first two new Airbus A330-200 aircraft. The new daily flight between Oakland and Maui is a first for Hawaiian. Flight #23 will depart Oakland daily at 12:20 p.m. and arrive in Maui at 2:20 p.m. Return Flight #24 will depart Maui daily at 9:35 p.m. and arrive in Oakland the following morning at 5:30 a.m. The new flight runs through September 6, 2010. The new daily flight between San Diego and Maui is being revived after service on the route stopped in the summer 2008. Flight #37 will depart San Diego daily at 10:35 a.m. and arrive in Maui at 1:05 p.m. Return Flight #38 will depart Maui at 10:30 p.m. and arrive in San Diego at 6:35 a.m. the following morning. The new seasonal service concludes August 24, 2010. Hawaiian will supplement its daily Los Angeles-Honolulu service with a new flight using the wide-body, twin-aisle A330-200 aircraft, which seats 294 passengers – 30 more seats than the Boeing 767-300 – in a two-class configuration. Flight #3 will depart Los Angeles daily at 10:45 a.m. and arrive in Honolulu at 1:15 p.m. Return Flight #4 will depart Honolulu daily at 10:30 p.m. and arrive in Los Angeles the following morning at 6:55 a.m. The extra flight runs through September 6, 2010. Tickets for the three new summer flights are now available for purchase. Hawaiian’s first three A330-200 aircraft are being leased and will join the fleet starting next April. In addition, Hawaiian has signed a purchase agreement with Airbus to acquire six wide-body A330-200 aircraft (starting in 2012) and six A350XWB-800 (Extra Wide-Body) aircraft (starting in 2017), as well as purchase rights for an additional six aircraft of each model.